Gardening is an essential survival skill that you don’t want to start learning during a survival scenario. Growing your own food is harder than it looks and a simple mistake could result in a lack of food for you and your family. 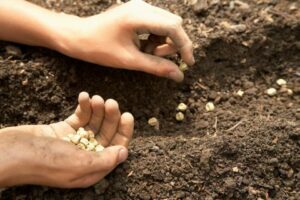 The following story is a fictional example to showcase some of the most common gardening mistakes. Sarah has finally decided to utilize the big, raised garden bed in her backyard. She figured that more seeds would mean more food, so she planted the following in the same bed, on the same day: tomatoes, pumpkins, green peppers, carrots, peas, strawberry plants, and herbs. It’s good to be excited, but planting too many seeds in the same space is a recipe for disaster. Sarah soon found there were so many things growing in her bed that she couldn’t tell the weeds from her plants – not to mention the pumpkin vines upsetting all of her carefully planted rows. The next time Sarah was ready to try gardening, she had moved to another state. This time, her husband Jim was involved in the project. He constructed four 8’ x 4’ beds and filled them up with dirt. Sarah and Jim researched every food they wanted to grow to find out when and how they should plant. So far, Sarah was off to a great start. It took longer than expected for the seeds to arrive the in the mail, and by the time Sarah started the pepper seeds inside – they were about 1 month behind schedule. Between her kids and summer vacations, Sarah had little time to spend on her garden. 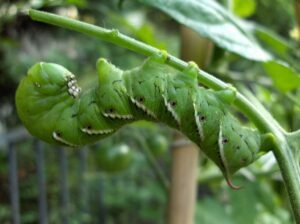 By the time Jim noticed the hornworms (pictured at right), several tomato plants had been decimated. And Japanese beetles had attacked most of the pumpkin plants. Inspired from last year’s success, Sarah had stocked up on cookbooks and mason jars and was ready for another successful harvest. Little did she know, she would encounter new problems that would decimate her project once again. The first problem she encountered was that her pepper seeds failed to grow. After some research, Sarah realized that her mistake was saving seeds from immature plants. You must save seeds only from fully mature plants if you expect them to germinate in the future. The second problem was too much rain. A little bit of mulch may have saved the tomatoes, but Sarah didn’t know about that at the time. The wet weather also affected her zucchini, squash, melon and pumpkin plants. When Sarah and Jim returned from a weeklong vacation, they found the garden overrun with powdery mildew and weeds. Her next problem involved insects – but not the bad kind. Sarah was flabbergasted when she cut into a pumpkin and found that it smelled and tasted like a melon. The problem was cross-pollination. Cross-pollination: the transference of pollen from one plant to another plant that has a different genetic constitution. Some plants are self-pollinators and can be planted anywhere. 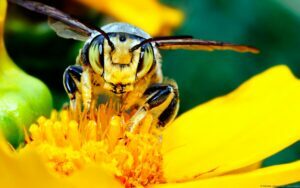 Others need help from bees to pollinate and produce food. If you plant two such plants beside each other, you run the risk of cross-pollination. Sarah has already made one mistake this year: she started too soon. She hasn’t put anything into the ground yet, but she started her indoor tomatoes too early. She can probably fix the problem with bigger pots, but she is now finding that tomato plants have particularly long roots. She worries that the current pots will stunt the plants’ growth. The two biggest lessons we can learn from Sarah’s story are to be patient and to do your research. That being said, it’s important to learn gardening and other survival skills before your life depends on them. Not only is gardening a useful skill, but gardens are a great way to save money on food and enjoy fresh, organic produce. Whether you want to experiment with hydroponic systems or grow a single plant in your backyard, I encourage everyone to start a garden of their own.